Well, a finished project. I didn't post the process of knitting this project, not really sure why, but I started it in early December, which makes it a fairly quick knit considering the size. 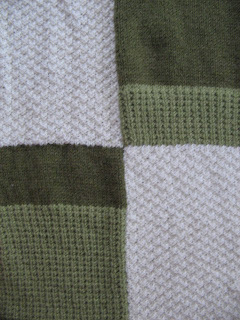 It's a throw for those cold nights, made from a free Patons pattern available here. 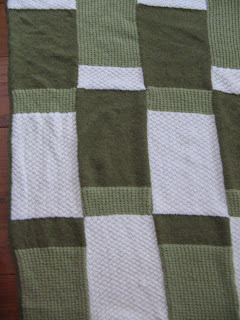 I used Patons Decor (the recommended yarn), though I never cared much for that yarn, however, it washes well, and wasn't nearly as "acrylic-y" as I had remembered. 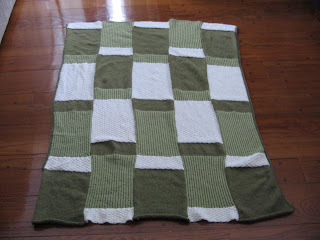 Instead of the sage greens used in the pattern, I chose the olives. I'm fairly happy with it. Now I need to finish a few other lingering projects. On an unrelated note, my Dad had a mild heart attack last Monday and needs to have bypass surgery. This is a huge shock for our family, as Mum and Dad both have an excellent diet and are very fit. I'm going to go and stay with them for a week once my Dad is released from hospital. I'm confident he'll recover quickly and I won't be needed for long. I'd also like to say thank you for all the lovely comments about Gus, he's a very sweet little dog (just a wee bit dim-witted). Hope your Dad is going to be OK. It's very difficult to realize that parents are not always going to be healthy. I hope your dad is back to normal soon!